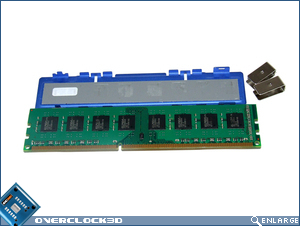 "After using these nippy blue modules in several of our DDR3 motherboard reviews, we thought it was about time we got up-close and personal with them by pushing them to their limits on our new DDR3 testbed." Very good write up, Jim! But the timings seem to lose at the moment... Stick with DDR2 until DDR3 price drops a little and they sort out those timings! Timings! Did you learn nothing from this lol. Edit: Well, they are very average aren't they. I think you should remove 'Reasonable performance' from 'The Good' and add it to 'The Mediocre'. Reasonable does not strike me as a good attribute. Fantastic wirte up as usual jim. Im forced too ask: how are they conning us this time? With DDR3 overall. we multiplying the REAL fsb by what? 4? 6? 8? Don't get me wrong im all for progress, i just like too be able too see through marketing.